Jörð is attested to in the Prose Edda and the Poetic Edda. She is further attested to in the archaeological record, being invoked in various charms, spells and prayers, such as the common Saxon charm, Aecerbot. Like Máni, she is often attested to in magic spells; and like Ullr we know she played a larger role in the daily religious observances of our forebears than the surviving literature about her might suggest. One particular cultic practice attested to her involved the pouring of milk and honey into the soil of farmland, asking for her blessing. 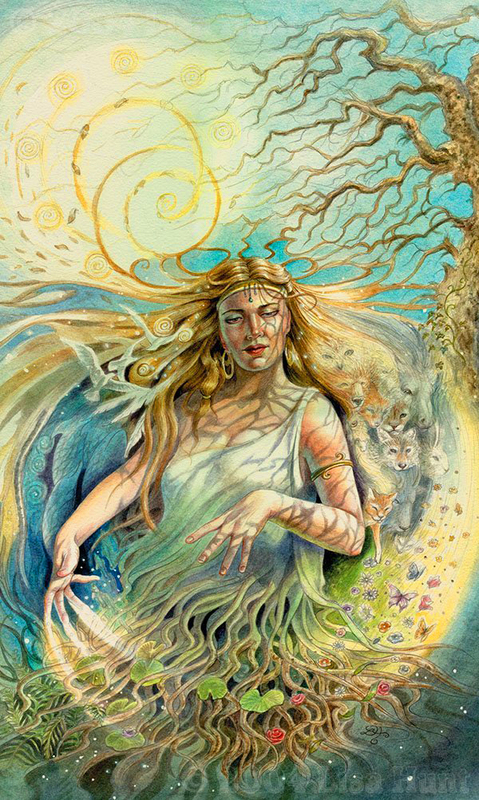 She is Mother Earth, the goddess who is the earth herself. Her name is pronounced “ee-YURth” with a soft “th” like in “leather,” rather than a hard “th”, like in “earth.” However, as English is a Germanic language, it is completely appropriate to also call her by her English name, Earth. 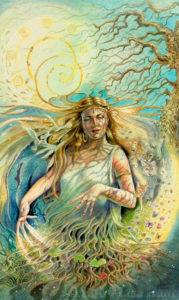 She is known around the world by many different names, and is perhaps most famous to Westerners under her Greco-Roman ones: Gaia and Terra. She is referred to as Frigga’s parent by the name of Fjörgyn, with another deity called Fjörgynn (the masculine version of Fjörgyn). While masculine-feminine name pairings are common among the Vanir, who married brother to sister, Jörð is older than both Æsir and Vanir tribes of gods. One theory is that Frigga was conceived of through parthenogenesis. Jörð, after all, is something of a reincarnation of Ýmir: her body is made out of the recycled remains of the hermaphroditic entity, who likewise created life with him-herself. Jörð herself is a jötunn, one of the elder race of giants. She is counted among the Asyjnur, the major goddesses of Ásgard, and she is a venerable, highly benevolent deity in her own right. One of the distinguishing traits of the Jötnar is that they tend not to care for, and are even hostile towards, humankind. The Jötnar counted among the gods of Ásgard are those who, like the gods, care for and watch over us. Interestingly, there are said to be nine Jörð-like giantesses, one for each of the Nine Worlds. Whether Jörð has eight sisters, or whether our forebears were aware of the other planets in our solar system, or whether Jörð exists inter-dimensionally, is not known. Like other divine mysteries, we leave that to you to decide for yourself. Jörð is the daughter of Nótt (Night) and Annar, both primordial Jötnar. She is the loving mother of Thor and Meili, by Óðin, and is considered to be the mother of Frigga. She is often called “Óðin’s bride,” in skaldic poetry and is one of his concubines – a position of great honour. She is one of the Giant-Brides, or Etin-Brides, those Jötnar who marry into the family of gods, and in so doing she is considered one of the Æsir. In the lore, she is described as wearing a girdle, and ditches, turf, gullies, escarpments, and other earth-work ledges were referred to as this girdle. Her name seems to be related to mountains and the physical terrain of the earth mass. You walk upon her, live in a dwelling constructed of her: she is inescapable, immanent, all around. She is, in many ways quite the opposite of many of the Abrahamic notions of the divine, who see the divine as necessarily outside of the world: she is the divine that is the world, herself. Many modern Heathens compare Jörð with Nerthus. It is entirely possible that they are one-in-the-same, with Nerthus simply being what this goddess was called in the more southerly Heathen lands now known as Germany and Austria. It is also possible that Nerthus is a separate goddess, the feminine aspect of Njörð. One interesting distinction seems to be that Nerthus is more strongly associated with lakes, rivers, bogs, islands and places where earth and water meet. Jörð on the other hand seems to be associated with all earthly terrain, fertile and barren, meadow and desert. These differences might be entirely regional and based on what the ground underfoot is like (marshland bogs or mountainous fjord), from which the two different names come from. The thing we think it most vital, is that the Northern Tradition is an earth-based tradition, which has numerous divinities who preside over the earth, including Freyr, Freya, Gefjon, and Gerð. Jörð appears to be the predecessor of these deities in the archaeological record, worshiped before them, but who continued to receive honour after their appearance as the pantheon grew. She is very much like a grandmother who receives ongoing respect, even while her children’s children come of age. All land wights may be seen as her attendants. Jörð is mother of them all, and may well lend to the Victorian concept of the Queen of the Fairies. Her son Thor, the protector of mankind, is also the protector of his mother. He is like Captain Planet, and it is vital we help him with this task, for in protecting her, he ensures a future for us. She is even recorded as being invoked in a prayer to help delay Ragnarök! In Ango-Saxon tradition, she is called “Mother of Mankind.” In prayers and petitions in the lore, she is called upon as the mother of all the gods, and asked to answer prayers. In particular, Jörð is invoked for help in finding and accessing healing herbs, and in activating their maximal potential. The earth, hills, mountains, and unspoiled wilderness. Healing herbs, bees, and grandmothers. Natural features that resemble a woman (womb-like caverns, hills shaped like breasts) and soil. Girdles, both as a garment, as a metaphor for ditches, turf, gullies, escarpments, and other earth-work ledges. Earth, Jorth, Fjorgyn, Eordan Modar (Mother Earth), Eorde, Erce, Fold, Fira Modor, Hlodynn, Hludana, Grund, Erda, Drighten. See Nerthus.